Weight Loss, Healthy Diet, Healthy Recipes, Nutrition and Fitness Expert: Smoothies: Healthy Treat or Overindulgence? Smoothies: Healthy Treat or Overindulgence? There are few things more refreshing than a cold, creamy smoothie on a hot summer’s day. With smoothie joints offering various fruity flavors and even enhancements promising improved immunity, weight loss, and muscle-building, these blended beverages seem like a super sweet deal, chocked full of health benefits! The fact of the matter is that while smoothies can be very healthy and good for you, if you are purchasing them from a store there are some unfortunate surprises: smoothies containing close to 1,000 calories! Yikes to anyone trying to lose weight! So what’s a hot, thirsty person to do? Luckily, I’ve go the inside scoop on how to navigate the smoothie shop’s menu for a cold treat that’s nutrition facts won’t leave you frozen in fright! 1. Stay away from smoothies with added sugar and full-fat yogurt or milk. Instead, ask about all fruit options with no additional sweeteners. 2. Get a small or even a kid’s size – and even then you might want to share! Fitting right in with the “supersize” mentality, the “small” size at Jamba Juice is 16 oz, and at Smoothie King it is a whopping 20 oz! 3. Check out your smoothie shop’s website! Smoothie King and Jamba Juice both have nutrition info posted online. Make a note of the smoothies that are lower in calories and sugar, and keep the list in your car, wallet, or even phone for a handy reference guide. This really is your best option, as even healthy sounding options may have something to hide. At Smoothie King, for example, the small “Grape Expectations II” smoothie has 548 calories and 125 grams of sugar . . . and is listed as a “snack right” option. I don’t know about you, but 548 calories sounds like more of a meal than a snack to me! 4. Not only can store-bought smoothies have a lot of added calories and sugar, but they can also be expensive. Why not try making your own smoothies at home? Stock your freezer full of frozen pineapple, peaches, bananas, and berries for a sweet treat that won’t break your bank account! Also, with summer here, visit your local farmer's market for fresh fruits and vegetables to add to your smoothies. To find one near you visit www.localharvest.org See below for my favorite combinations. 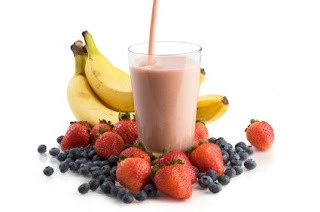 Banana Berry Smoothie: In a blender, combine 1 frozen banana, 1 cup of almond, hemp or organic 1% milk, and ½ cup of frozen berries (your choice!). Pumpkin Pie Smoothie: Blend together 1 frozen banana, ½ cup of canned pumpkin puree, 1 cup of almond, hemp or organic 1% milk, and 1 tsp of pumpkin pie spice. Pineapple Lemon Bliss Smoothie: Blend together 1/4 lemon (peeled), 3/4 cup of fresh pineapple, 1 cup almond, hemp or organic 1% milk, 3/4 cup ice. Cinnamon Apple Smoothie: (high powered blender works best) 1/2 Granny Smith apple, 1 teaspoon cinnamon, 1 frozen banana, 1/2 cup fresh pineapple, 1/2 cup ice. If you want to buy the best blender to help you eat more of a whole foods diet and to pulverize a Granny Smith apple, carrot, or ice in seconds get a Vita-Mix. I've only had mine a few months and I use it every day to make smoothies for my husband, kids and myself. We all have our own favorite recipes! Sometimes we throw in a few carrots and/or a handful of baby spinach to boost the nutritional content and you can't even taste them. نحن من أهم الشركات الرائدة بمجال الصيانة المنزلية بجدة وقد تكون شركتنا واحدة من الشركات المتميزة التي تسعى دوماً راء ما يرض العميل ، من حيث تنفيذ العمال الخاصة بطبيعية الصيانة التي يحتاج إليها، كما أن الشركة تعمل بجد واجتهاد وبحرص على ممتلكات العميل أن تتعرض لأي نوع من التلفيات، فنحن نعتمد على الخبرة والتميز بالكامل فكل عامل يعمل لدى شركتنا حاصل على شهادات الخبرة التي تجعلها واحد من أهم العمال المعتمد عليهم في أداء أعمال الصيانة الشاملة، فشركة تقوم بتقسيم عمالها على حسب طبيعة عملها فيوجد لدي الشركة فريق خاص بأعمال الدهان وتركيب ورق الحائط، كما يتوافر لديها فريق خاص بكافة مهام السباكة وغيرها من المهام الأخرى. عزيزي العميل إليكَ واحدة من أهم الشركات التي تعمل بكافة مجالات العزل بالمدينة المدينة المنورة، كما انها تعمل على توفير الكثير من الخدمات الي يكون العميل بحاجة كبيرة إليها، يعد العزل من اهم المهام التي يحتاج لها المبنى لحمايته وسلامته من أن يتعرض لمشكلة تسرب المياه أو لأشعة الشمس الحارقة فكل هذا يؤثر على الأسقف والتالي يؤثر على المبنى بالكامل، ولهذا أنت بحاجة كبيرة إلى القيام بعملية العزل التي تساهم في حماية المنازل من أن تتعرض لبعض من العوامل المناخية المؤثرة على الأسطح والأسقف، وبهذا عزيزنا العميل أن بحاجة لأفضل شركةعزل بالمدينة المنورة تعمل على تقديم الكثير من خدمات العزل المختلفة، ويفضل أن تكون شركة عزل بالمدينة المنورة. Dans l'obscurité sans fin,Chaussures Air Max 90 à Vendre les cordes serrées, les notes malpropres ont infiltré mon coeur, seulement un endroit, les cicatrices, mais la lumière toujours brillante! Quand les pensées sont nouées, je serai déliée. Quand je joue avec les choses, je vais me tirer en arrière. Quand je regarde en arrière, j'ai disparu, mais c'est bon de Nike Air Max 90 Premium pour homme vous avoir! Dans les champs, le temps passe, je prends sa main, marche dans la désolation, n'ai pas besoin de trop de mots décoratifs, adjectifs, noms, les deux dieux rendez-vous, c'est comme un dialogue, pour que je ne sois pas froid, pas mal,Femmes Nike Air Max 90 Flyknit classique À nouveau seul. Au moment de déchirement, ce ne sont pas des condoléances ou du papier toilette. Seuls les yeux forts, chauds et maussades sont confondus par le jeu, les choses modernes, enfermés dans des boîtes carrées, dans le désespoir, l'agitation et la tourmente de la vie. La serrure qui m'a Femmes Nike Air Max 90 Patch en caoutchouc sauvé de là. Detox Diets: Worth It or Useless? Buyer Beware with Food Labels!